It was a strong performance today across the board, it was hard to find a poor player. A brilliant second half performance has secured Adelaide a 23-point win over Woodville-West Torrens on Saturday afternoon. 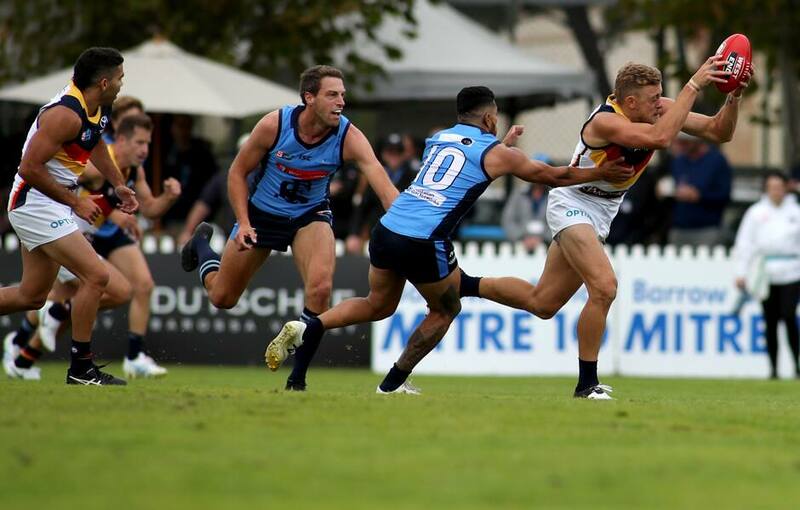 Led by Hugh Greenwood, the Crows kicked nine goals to four after half time to earn the 14.16 (100) to 10.17 (77) win. Greenwood booted two goals from the midfield to go with 33 disposals, 10 clearances and five tackles. He complemented fellow midfielder Patrick Wilson well, who had 42 touches, 10 inside 50s and kicked at 81 per cent efficiency. The forward lined functioned well with Elliott Himmelberg marking strongly all game and kicking two goals, while Matthew Wright (three goals) and Tyson Stengle (two) also hit the scoreboard. In his first game for the SANFL Crows, Bryce Gibbs played a consistent game, collecting 28 touches, six clearances and six tackles. Darcy Fogarty (six spoils) and development squad member Hamish Latchford (10 rebound 50s) both had solid games down back. State League coach Heath Younie said he was really proud of the response from the group after a difficult game last week. “We were challenged as a footy club after last week and I thought the attitude and effort was outstanding,” Younie said. “They brought 100 per cent effort from siren to siren and as a result, got rewarded for it. Younie said Greenwood was a class above against the Eagles. “I thought Hugh played above the level today,” he said. Andy Otten is the travelling emergency with the AFL side and didn’t play despite being named in the initial squad.